You must make reservations at least 5 minutes in advance of the time at sixth + mill pizzeria and bar. 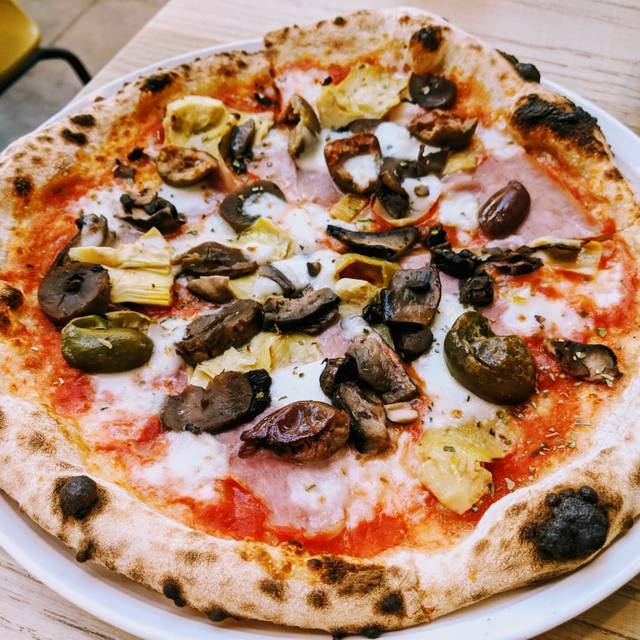 sixth+mill pizzeria and bar is a new concept from Chef Angelo Auriana & Restaurateur Matteo Ferdinandi offering a casual dining destination celebrating the regions of Southern Italy. 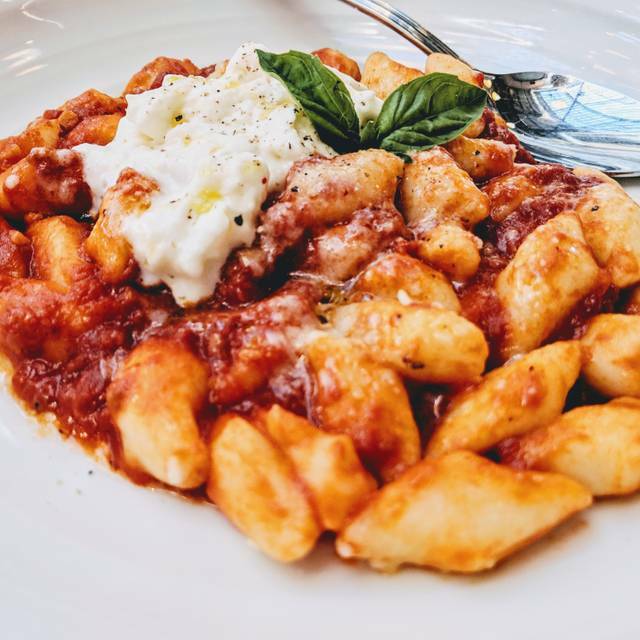 The risto-pizzeria also features hard durum wheat pastas, and a selection of shared small plates and dishes inspired by Chef Angelo’s childhood memories. Sommelier Francine Diamond-Ferdinandi presents a wine and beer list along with full bar to pair with the approachable menu. Excellent food and service in a casual setting. Great food. Disastrous service. Keep asking if they can take plates away when there is food left to eat. Man! Have some courtesy! A great pizza and pasta place!!! My grandkids ate everything! The diavolla pizza was delicious. Our waitress was very helpful. Highly recommend. A wonderful casual Italian bistro with great pizzas, meatballs and pasta. Reasonably priced and a terrific place for business lunch. We loved it here. Met an old friend for lunch and it was the perfect atmosphere for a reunion, with the best service ever. I wish I remembered the waiter's name so I could give him a shout out. The atmosphere here is casual while elegant in terms of the food and service. We found out it is part of the Factory Kitchen family, which we like, but Sixth + Mill feels more warm and friendly. The factory Kitchen is a little pretentious and self-conscience. We'll be back here often. Delicious food, fantastic service. The pizza's are fantastic and I think you should keep the arancini beyond a special. Everything was perfect! This is a nice casual spot. Unfortunately, I chose it for my wedding anniversary dinner, so it probably felt a little off for that reason. Overall, the flavors are great. My one complaint surrounds their central offering: pizza. The crust is beyond soggy — it's almost non-existent. Not only can a slice not be picked up, but even when cut into, it barely supports the toppings. L.A.'s is finally seeing its fair share of quality pizza places, and the best ones know how to make a good crust. I had a reservation for 6:30opm, didn't arrive until 7:00pm, had great dinner. The restaurant reported me to Open Table as a no-show. I got a threatening letter from Open Table the next day. I tried to reach both Open Table and 6th and Mill to clear it up, had no success. Our pizza was not hot but I’m not sure if it was supposed to be served that way. The gnocchi plate was hot but the gnocchi was also pretty tepid. Marc was our server and he killed it. He was very helpful with moving tables for us before and during our meal. Excellent food. Excellent service by Philip. Going again soon. What a true find. Great fresh food, friendly service, excellent vibe and reasonably priced. Will most definitely come back...……………. Things started off well as I prefer restaurants with enough lighting so that you can see the menu and whatever it is you’re eating, but not so bright like you’re in a hospital or lab. Noise level was decent, could hear my girlfriends who were sitting across from me. Got our menus and decided to order a bottle of rosé (only $32) and a glass of moscato (for one girl who only like really sweet alcohol), while we asked to continue looking through the menu for food items. When our rosé & moscato came, my girlfriend mentioned how the rosé could be colder, so in response our waiter offered to bring an ice bucket to which we accepted. He runs off, after pouring our drinks, but without asking us if we’ve decided on food choices or giving us a chance to let him know we’re ready to order. So we sit thinking he’ll be back with the ice bucket.. but instead he goes to all the other tables he’s waiting on (which have food) while we just sit there waiting for our orders to be taken and the ice bucket to be brought. We order the apulia pizza, pat pizza, mista salad, parmigiana eggplant, and arancini. Wow, talk about lackluster. Everything could’ve been so good, but it just felt flat on flavor. Which just made the experience even more annoying. Left $12 tip for a $113 bill -even then it felt like a waste of money. Lovely Valentine's day dinner. Great wine selection that pairs nicely with the pizzas. Food was AMAZING! Shared a buffalo pizza special and the pasta al forno. The only issue was the table setup. I was squished at a table for two in between two other tables for two with about a foot of space behind me and to my sides. The waitress could barely reach us and it would have been very easy to accidentally knock over someone's wine glass. I hope they changed the layout of the tables for valentines day and that it is not normally like this. Other than that, it was amazing, and I plan on coming back. Place was airy and filled with light - nice interior. Food was delicious and the waiter was helpful in explaining the dishes we asked about and what were his recommendations. Portions were generous and could be shared with others in our table. Beer and wine was excellent and complementary to the food. I would definitely come back and suggest it to our friends. will think hard about returning. Food was very good for taste, but not what I expected at all. I ordered the fried dough and a pizza. The main course ended up arriving first and well, wasn't a normal pizza. The only cheese on the pizza was the specialty topping, otherwise you just saw red. It tasted good, but I expect a pizza to have cheese to cover the red sauce. The toppings were few, but the pizza was large. The fried dough again was different - having the sauce and topping already on it. Slightly sweet. Service started with difficulty but I got the hang of just calling over any of the serving staff and things got better. I do plan on going back, the taste was that good. But I will certainly ask many, many more questions when ordering. Exquisite contemporary Italian restaurant, a somewhat more casual version of the delightful Oficine Brera next door. Offering small and large plates, all the dishes are wonderfully well-prepared and presented with unique and appealing flavor and seasoning. The high ceilings and open floor plan make for a light-filled and comfortable ambiance. Service is uncommonly friendly and capable. A delight. Very good pizza and meatballs. Bloody Marys were not on the Sunday cocktails options. We were told the mix won’t stay fresh so the bar won’t make them. In some form, should be offered on Sunday. Great food, service and ambiance. Everyone was so friendly as well. Everything that we order was excellent, beyond our expectations. One of the best I've been in awhile. We really like the place design and architecture. A casual refined Pizzeria with excellent service. Great place to eat, my wife came here on a Friday after work for date night and it was great. We had been here one other time and had great food and cocktails so we decided to give it another go! We had the meatballs as an appetizer, the cacio e pepe and the pasta al forno along with the scugnizzo to drink (it's basically an Aperol Spritz). All were excellent, we will definitely be back again. This is my second visit and because I so love two entree, meatballs and arugula salad, I was a repeater. You can share these dishes because truly the portions are quite generous. The sauce on the meatballs and quality of the meat are outstanding and the salad is fresh and perfectly dressed. Olives are a great side dish and the pasta with prosciutto is amazing as the meat is crispy and integrated into the dish. 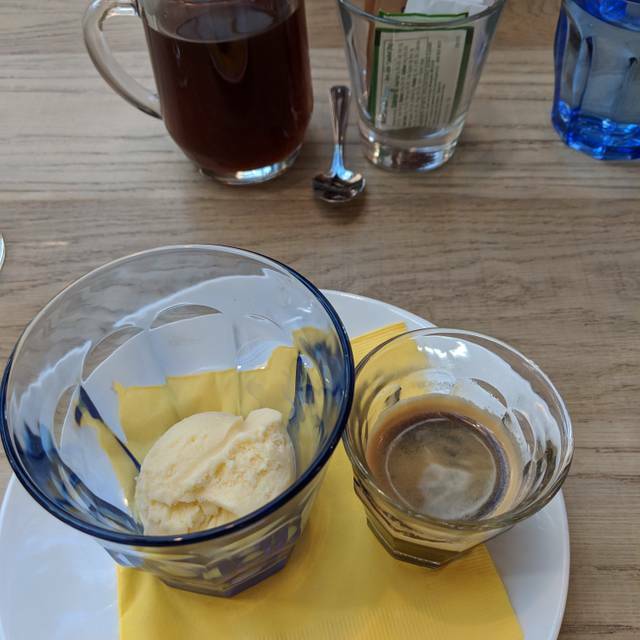 Dessert was a bomb. Service and staff professionalism was a plus. 😍 Love it. Paid parking is a plus in that you do not have to walk down sixth street because the homeless encampment is just down the block, crossing Alameda. My two Whistle Pig Old Fashions we’re spot on with a lemon and Orange rind. The service is always excellent and wait staff check with you periodically to make sure you’re enjoying your meal. The pizza toppings are fresh and the dough is baked to perfection. If you’re a big eater you will need to accompany your pizza with a salad and pasta dish or appetizer. 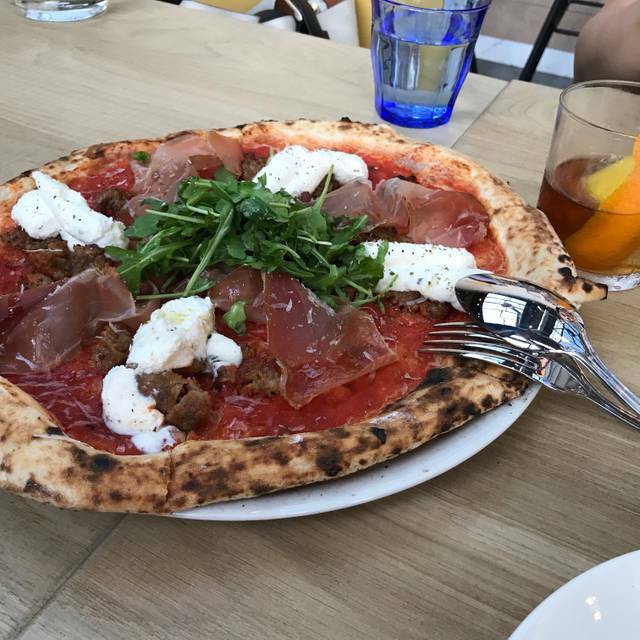 It equals or rivals other high end pizza restaurants in L.A. I have been here twice in the past few weeks and am SO HAPPY sixth and mill has opened in the neighborhood. The food is amazing. The atmosphere is beautiful. I am a huge fan. Was tasty but felt bad for our waitress. We waited a long time because she had a full house. Sixth & Mill has some of the best pizza in Los Angeles. As a former east coaster I’m constantly searching for great pizza and wine, sixth & mill is the place for both. Great service is also standard. Cheers! This is a great place for a casual meal. Service is prompt and very knowledgable . Here's the thing. A restaurant that calls itself a pizzaria needs to be able to crack the code of a crispy crust and the congruence of flavors. All four of us ordered pizzas with delicious sounding descriptions. The final product was meh....the toppings aside, the crust was soggy. Both Pizza Rev and Piology make a better crust. And the topping flavors were flat. We also ordered desert, specifically the torta (chocolate flourless cake) and the ricotta cheesecake. Neither were particularly good and we sent back the chocolate cake. One exception. The cauliflower appetizer. That was really delicious. There are just too many good places to eat in LA - sadly this was just really mediocre - at least for pizza. Maybe other dishes are better. Great service. Pizza was terrible. Cool loft space but bright lighting.